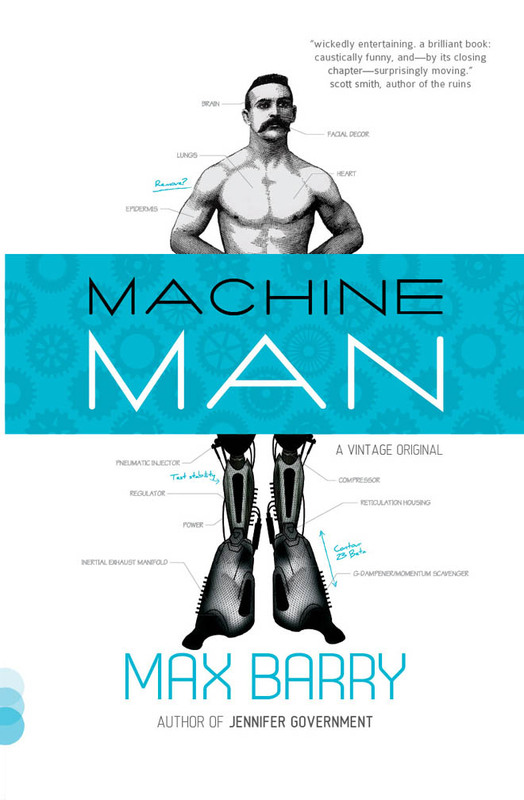 Max Barry released a video trailer for his latest novel, Machine Man, which completely and utterly sums up the tone of the entire novel. It's bitterly comedic, which is something I've come to expect from the writer. Machine Man is easy to sum up in a single sentence: it's about a man who cuts off his own limbs to replace them with parts he makes himself. It's one of the few examples of cybernetics in fiction that I can think of readily (Robocop also comes to mind), and it's a fun, easy look at some of the problems associated with identity and of making one's self better. Charles Neumann is a scientist for a major company that has its fingers everywhere, and after locating his missing cell phone, he accidentally looses his leg. After working on recovering, he builds his own prosthesis, and finds that he'd like a matching pair. The company is more than willing to accomodate him: he's able to build some incredible technology, and the team that he's assembled goes through breakthrough after breakthough, building all types of things to make people *better*. The story is somewhat predictable, and Neumann begins to lose some of his humanity as he replaces more and more parts, putting his relationship with Lola in risk as he circles the drain. I liked this book: it's a quick, fairly easy and immersive read, and I found myself going through a hundred pages a sitting before finishing it. Written as an online serial to complete the first draft, the book feels remarkably consistant, although there are points towards the end where it begins to drag and slow down a bit. Machine Man is also very funny, something I remembered enjoying from the other book I have from Barry, Jennifer Government. It's a blistering satire at times, jumping right out of the gate with the problems associated with a missing smartphone that sets Charles down the path of becoming more machine than man. Anyone who's owned an iPhone knows exactly what I'm talking about, and Barry brings up some good points between the two characters: Lola has mechanical parts in order to survive from day to day (an artificial heart), while Charles simply feels like he's a robot anyway, and wants the convinience and advances that robotics would bring him. While it's funny, pithy and sarcastic, it feels like there's a good point to be made here: with everything that technology allows us, how much is too much, but more importantly, would we be able to recognize our overdependance on technology if we even realized that we were depending on it too much? This isn't a case of Barry standing on the front porch yelling for kids to get off his lawn, but one of rationing and realizing that there can be too much of a good thing, and the book balances a fine line between cyberntic fight scenes and morality, telling a straightup tale of human nature. It's a little frustrating at points for me personally, especially running up to the end, when it's clear that most of the characters, despite their tendencies to make clear and rational decisions, to continue making the same choices, despite what it's cost them. It's pointed out to Lola that she has had problems recognizing a person's character and getting too involved with their struggle, even to her detriment, something that largely happens again when she meets Charlie. The same is true for Charlie, who keeps building pieces of himself, no matter what it costs. It's a relevant message, one that bears paying close attention to. At the end of the day, Barry's put together a solid, fun science fiction thriller that doesn't feel like a science fiction story: it feels contemporary (and, much to my annoyance, it's shelved as such, which made it difficult to find in Barnes and Noble), and highly realistic, as if it's a future that we're living in right now.